Our commitment to constant, never-ending improvement is why we’ve grown such a loyal customer base. 1-800-PetMeds® today announced it is celebrating its 20th Anniversary as America’s Largest Pet Pharmacy. During its 20 years delivering the highest quality pet medications, food and supplies, 1-800-PetMeds has proudly served over 9 million satisfied customers. 1-800-PetMeds is a fully-licensed pharmacy, having been awarded Vet-VIPPS accreditation by the National Association of Boards of Pharmacy ® (the same association that accredits Walgreens.com, and CVS.com). The company is also an A+ Accredited member of the Better Business Bureau. 1-800-PetMeds’ state-of-the-art pharmacy employs the largest staff of veterinary pharmacists in the world, who monitor for drug interactions, ensure valid expiration dates and accuracy of pet prescriptions, and also suggest generics to help save customers money. The high volume of prescriptions filled ensures that customers receive the freshest products, often at much lower prices than found elsewhere. In addition to offering prescription pet medications, 1-800-PetMeds also has developed a popular line of private label products made from the healthiest, natural ingredients, all of which rival top brands. 1-800-PetMeds brand products are independently tested by third parties, and periodically improved upon based on customer feedback. 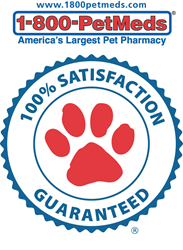 Part of what has made 1-800-PetMeds America’s largest and most trusted source of pet medications and supplies is the 100% Satisfaction Guarantee they offer on all items. Customers can feel confident in purchasing from 1-800-PetMeds, knowing that they will receive superior customer service, expert pet care advice and low prices on all major brands of pet medications. Fast and convenient shipping has also helped 1-800-PetMeds become a leader in the pet care industry. Founded in 1996, PetMed Express is America's largest pet pharmacy, delivering prescription and non-prescription pet medications and other health products for dogs, cats, and horses at competitive prices direct to the consumer through its 1-800-PetMeds toll free number and on the Internet through its website at http://www.1800petmeds.com.